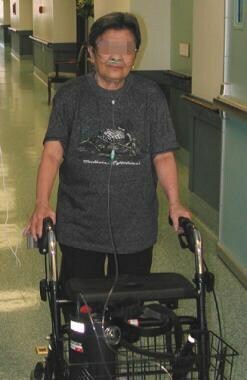 Pulmonary rehabilitation has been defined in the following terms: A multidimensional continuum of services directed to persons with pulmonary disease and their families, usually by an interdisciplinary team of specialists, with the goal of achieving and maintaining the individual's maximum level of independence and functioning in the community. Pulmonary rehabilitation aims to reduce symptoms, decrease disability, increase participation in physical and social activities, and improve the overall quality of life (QOL) for patients with chronic respiratory disease. These goals are achieved through patient and family education, exercise training, psychosocial and behavioral intervention, and outcome assessment. The rehabilitation intervention is geared toward the unique problems and needs of each patient and is implemented by a multidisciplinary team of health care professionals. For patient education resources, see the Public Health Center, as well as Resistance Training. The benefits of pulmonary rehabilitation are seen even in irreversible pulmonary disorders, because much of the disability and handicap results not from the respiratory disorder per se but from secondary morbidities that often are treatable if recognized. Although the degree of airway obstruction or hyperinflation of chronic obstructive pulmonary disease (COPD) does not change appreciably with pulmonary rehabilitation, reversal of muscle deconditioning and better pacing enables patients to walk farther and with less dyspnea. 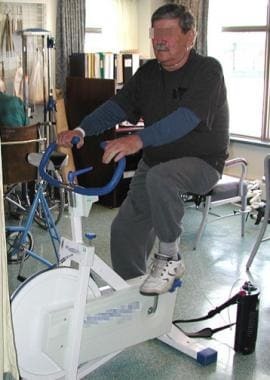 Pulmonary rehabilitation programs include prevention, early recognition and treatment of morbidities, and inpatient, outpatient, and extended care of patients with chronic respiratory illness. The anticipated patient outcomes of a comprehensive pulmonary rehabilitation program include increased independence and improved QOL, as well as fewer hospitalizations or shorter hospitalization time. Disease is a pathologic condition of the body with a unique set of symptoms and signs, often resulting in impairment. The impairment may lead to functional deficit. Impairment is any loss or abnormality of psychological, physical, or anatomic structure or function. Disability is any restriction or lack of ability (as a result of an impairment) with regard to the performance of an activity in the manner or within the range that is considered normal for a human being. Impairment of activities of daily living (ADL) has an impact on the capacity of the individual to live independently. A handicap is a disadvantage for a given individual, resulting from an impairment or a disability that limits or prevents the fulfillment of a role that is normal for that individual. For patients with pulmonary impairment, disability can be due to muscle dysfunction, primary skeletal or cardiopulmonary pathology, poor endurance, or some combination of impairments. The patient can be handicapped further by inadequate finances, inadequate family support or education, and various public policies. A successful rehabilitation program identifies and differentiates the disease process (ie, impairments, disabilities, handicaps) so that remedial strategies can be determined. The functional consequences of these impairments are addressed so that the person with chronic respiratory impairment is returned to the fullest possible physical, mental, social, and economic independence. The effectiveness of a comprehensive pulmonary rehabilitation program has been established by controlled clinical trials. Several impairments, such as weakness, dysfunction of peripheral and respiratory muscles, anxiety and depression, and abnormalities of nutrition, have responded to treatment. Improvements in overall and exertional dyspnea, as well as health-related QOL, have been documented. Significant increases in maximal exercise capacity, as measured during exercise testing, have been observed. In the only randomized study that has been conducted, survival benefit was not demonstrated, possibly because of the inability to detect the difference. Controlled trials have shown a decrease in health care resource use after rehabilitation, indicated by reduction in the number of hospitalizations and emergency department or physician office visits. Although not conclusively proven, the effect of pulmonary rehabilitation on outcomes in patients without COPD may be substantial. Retrospective study has shown no significant difference in improvement in exercise tolerance or QOL following pulmonary rehabilitation in COPD versus non-COPD patients. Therefore, pulmonary rehabilitation is effective for patients with disability due to any chronic respiratory disease, not just COPD. Respiratory rehabilitation may improve prognosis in patients who develop COPD exacerbation. Evidence from 6 trials suggests that respiratory rehabilitation is effective in COPD patients after acute exacerbation. Pulmonary rehabilitation is indicated for patients with chronic respiratory impairment who, despite optimal medical management, are dyspneic, have reduced exercise tolerance, or experience a restriction in activities. Indication for pulmonary rehabilitation is based not on the severity of physiologic impairment of the lungs but on the persistence of symptoms, disability, and handicap. Although chronic obstructive pulmonary disease (COPD) remains the major disease involved in referral for rehabilitation services, patients with other conditions may be appropriate candidates for pulmonary rehabilitation, because the same principles of ameliorating secondary morbidity apply. Examples include asthma, chest wall disease, cystic fibrosis, bronchiectasis, interstitial lung disease, lung cancer, selected neuromuscular diseases, postpolio syndrome, and perioperative conditions (thoracic or abdominal surgery, lung transplantation, lung volume reduction surgery). Exclusion criteria include conditions interfering with rehabilitative processes or that could cause risk during exercise training (eg, cognitive dysfunction, severe pulmonary hypertension, unstable angina, recent myocardial infarction). performed using either incremental exercise testing or a timed, 6-minute walk test. Pulmonary function testing is very helpful in identifying the disorder as obstructive (B) or restrictive (A) and also helps to quantify the severity of the dysfunction. Other assessments that may be performed include measurements of respiratory muscle strength (eg, maximum inspiratory and expiratory pressures), measurement of peripheral muscle strength, assessment of performance of ADL, health status, cognitive function, emotional and mood state, and nutritional status, as well as body composition. Questionnaires may be used to screen for anxiety and depression. Several such instruments (eg, the Beck depression inventory [BDI], the geriatric depression scale [GDS]) are available. Nutritional assessment is important, because changes in body weight, body composition, or eating habits are common in patients with advanced respiratory disease. Body composition can be evaluated using anthropometry, bioelectrical impedance analysis, or dual-energy radiographic absorptiometry (DRA), which estimates lean body mass. Despite a substantial variability in program structure, the efficacy of pulmonary rehabilitation performed in inpatient, outpatient, or home settings has been documented. The structure and components of the program, rather than the setting itself, determine the effectiveness of pulmonary rehabilitation. The choice of setting often depends on the variability and distance to the program, insurance payer coverage, patient preference, and the physical, functional, and psychosocial status of the patient. Inpatient rehabilitation generally is recommended for patients affected to the greatest degree, because intensive rehabilitative services and specialized training for the patient and/or family will be available. Outpatient rehabilitation, which can be hospital or community based, has the potential to benefit most patients but nonetheless requires a certain level of functional ability. Although outcomes have not been well studied, home-based pulmonary rehabilitation is convenient for the patient and family members and may provide sustained motivation for continued exercise training. Because rehabilitation offers a holistic and comprehensive approach to medical care, the combined expertise of an interdisciplinary team is necessary. The rehabilitation team is led by a physician specialist skilled in evaluating the neuromuscular, musculoskeletal, cognitive, and cardiopulmonary systems. The physician should be trained in cardiopulmonary and exercise fitness, ventilator management, and treatment of functional deficits. The physician should be skilled in working with a team of professionals, because he/she is responsible for the medical treatment and rehabilitation program. The other members of the rehabilitation team include a physical therapist, occupational therapist, rehabilitation nurse, social worker, respiratory therapist, vocational counselor, and psychologist. A successful team maintains coordination, cooperation, and open communication. Each member also needs to have knowledge of the general principles of other members' approaches. The goal of treatment is to preserve optimal lung function, thereby preventing symptoms and recurrence of exacerbations and, as a result, improving function in daily living, as well as QOL. Once the diagnosis of chronic obstructive pulmonary disease (COPD) has been established, educate the patient about the disease (see the image below). Encourage the patient to actively participate in therapy. A Venn diagram shows that chronic obstructive pulmonary disease (COPD) is actually a combination of emphysema and chronic bronchitis. 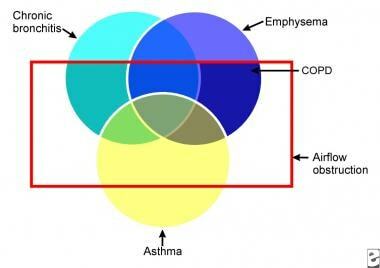 Many patients with COPD also have an asthmatic component. 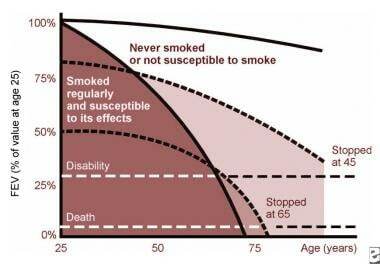 Smoking cessation continues to be the most important therapeutic intervention (see the image below). Many patients with COPD have a history of smoking, and many currently smoke. A smoking cessation plan is an essential part of a comprehensive management strategy. The success rates of smoking cessation plans are low because of the addictive potential of nicotine, the conditioned response of individuals who smoke to smoking-associated stimuli, forceful promotional campaigns by the tobacco industry, poor education, and psychological problems faced by patients who attempt to quit smoking, including depression. Any smoking cessation program must involve multiple interventions. This Fletcher and Peto diagram demonstrates the natural history of chronic obstructive pulmonary disease (COPD) and the benefits of smoking cessation, even when lung disease is advanced. Smoking intervention programs include self-help, group, physician-delivered, workplace, and community programs. Setting a quit date may be helpful. Physicians and other health care providers should participate in setting the target date and should follow up with respect to maintenance. Successful cessation programs usually employ such tools as patient education, establishment of a quit date, follow-up support, relapse prevention, advice for healthy lifestyle changes, social support systems, and adjuncts to treatment (eg, pharmacologic agents). Advise to quit through personalized messages. Arrange follow-up care and support. Brief behavioral counseling (ie, under 10 min) and pharmacotherapy are each effective alone—although they are most effective when used together. The task force also advises clinicians to ask all pregnant women, regardless of age, about tobacco use. Those who currently smoke should receive pregnancy-tailored counseling supplemented with self-help materials. Supervised use of pharmacologic agents is an important adjunct to self-help and group smoking cessation programs. Nicotine is the ingredient in cigarettes that is primarily responsible for addiction. Withdrawal from nicotine may cause adverse effects, including anxiety, irritability, difficulty concentrating, anger, fatigue, drowsiness, depression, and sleep disruption. These effects usually occur during the first several weeks of any attempt at smoking cessation. Nicotine replacement therapies after smoking cessation reduce withdrawal symptoms. A smoker who requires his/her first cigarette within 30 minutes of waking up is most likely to be highly addicted and could benefit from nicotine replacement therapy. Several nicotine replacement therapies are available. Nicotine polacrilex is a chewing gum with better quit rates than counseling alone. Transdermal nicotine patches are available readily for replacement therapy. Long-term success rates range from 22-42%, compared to 2-25% with a placebo. These agents are well tolerated, and the adverse effects are limited to localized skin reaction. Nicotine replacement therapy patches are sold under the trade names NicoDerm, Nicotrol, and Habitrol. The usual drug-dosing schedule is the same for all 3 brands. Individuals who smoke more than 1 pack per day initially need a 21-mg patch, followed by 14-mg and 7-mg patches. Nicotine replacement therapy chewing pieces are marketed in 2 strengths (ie, 2 mg, 4 mg). An individual who smokes 1 pack per day should use 4-mg pieces. The 2-mg pieces are to be used by individuals who smoke less than 1 pack per day. Instruct patients to chew hourly, as well as at the time of their initial cravings for 2 weeks. Gradually reduce the amount chewed over the next 3 months. The use of an antidepressant medication (eg, bupropion) also is effective for smoking cessation. A study recorded sustained cessation at 1 year for 23% of smokers using bupropion (which enhances central nervous system nonadrenergic function), as opposed to sustained cessation for 12% of smokers using a placebo. Bupropion also is effective in patients who have not succeeded with nicotine replacement therapy. The most recent drug to receive approval for smoking cessation is varenicline (Chantix). It is a partial agonist selective for alpha 4 beta 2 nicotinic acetylcholine receptors. Action is thought to result from activity at a nicotinic receptor subtype, where its binding produces agonist activity while simultaneously preventing nicotine binding. Agonistic activity is significantly lower than that of nicotine. Gradually titrate the dose upward within 1 wk before the quit date to 1 mg twice a day orally after meals. Decrease the dose with severe renal impairment or end-stage renal disease. Serious neuropsychiatric symptoms have been reported during postmarketing surveillance and may include changes in behavior, agitation, depressed mood, suicidal ideation, and attempted and completed suicide; these adverse events have been exhibited in patients without preexisting psychiatric illness, and patients with preexisting psychiatric illness have reported worsening symptoms during varenicline treatment; for more information, see the FDA MedWatch Safety Information. The minority of patients who respond to oral corticosteroids could be maintained on long-term inhaled steroids. Despite a lack of conclusive evidence to support the role of inhaled corticosteroids in the management of COPD, the use of these agents is widespread. Researchers have completed 3 large, placebo-controlled trials investigating the use of these agents in severe, mild, and very mild disease. Based on the rate of decline in the forced expiratory volume in 1 second (FEV1), results from these 3 trials suggest that inhaled corticosteroids do not slow the decline in lung function but do decrease the frequency of exacerbations and improve disease-specific and health-related QOL. Inhaled corticosteroids have fewer adverse effects than do oral agents. Although effective, these agents improve expiratory flows less than oral preparations do, even at high doses. These agents may be beneficial in slowing the rate of progression in a subset of COPD patients who demonstrate rapid decline in pulmonary function. Inhaled beta 2–agonist bronchodilators activate specific B2-adrenergic receptors on the surface of smooth muscle cells; this raises levels of intracellular cyclic adenosine monophosphate (AMP) and increases smooth muscle relaxation. Patients, even those who have no measurable increase in expiratory flow, benefit from treatment using beta 2 agonists. Methylxanthines have decreased in popularity because of their narrow therapeutic range and frequent toxicity. Their mechanism of action may involve increased intracellular calcium transport, adenosine antagonism, and inhibition of prostaglandin E2. Additionally, methylxanthines may improve diaphragm muscle contractility. Beta-2 agonists produce less bronchodilation in patients with COPD than they do in patients with asthma. Furthermore, spirometric changes may be insignificant, despite symptomatic benefit. Patients primarily use beta-2 agonists for relief of symptoms of COPD. Inhaled beta-2 agonists are the initial treatment of choice for acute exacerbations of COPD. In stable patients, beta-2 agonists have an additive effect when used with an anticholinergic agent (eg, ipratropium bromide). Although oral preparations of beta-2 agonists are available, the preferred route of administration is inhalation. Use a spacer, if indicated, to improve aerosol delivery and reduce adverse effects. Two long-acting beta-2 agonists (ie, formoterol, salmeterol) are available. They improve symptoms and morning peak flows and may be useful when bronchodilators are used frequently. More studies should establish the best role for these agents. Treatment with aerosolized anticholinergic agents (eg, ipratropium bromide) may be more effective than a beta-2 agonist would be in patients with COPD. Ipratropium bromide has bronchodilatory activity with minimum adverse effects and is administered by a metered dose inhaler. Studies in patients with stable COPD have shown that ipratropium bromide has equivalent or superior activity when compared with a beta-2 agonist. In combination with a beta-2 agonist, there is an additional 20-40% bronchodilation. This medication has slower onset and a longer duration than a beta-2 agonist and is less suitable for use as needed. Inhaled anticholinergic bronchodilators do not influence the long-term decline of FEV1. Initiate regular therapy with an ipratropium at 2-4 puffs 4 times a day and add a beta-2 agonist as needed. Anticholinergic drugs compete with acetylcholine for postganglionic muscarinic receptors; these agents thereby inhibit cholinergically mediated bronchomotor tone, resulting in bronchodilation. They block vagally mediated reflex arcs that cause bronchoconstriction. The onset of action is slower (eg, 30-60 min). Theophylline improves respiratory muscle function, stimulates the respiratory center, and promotes bronchodilation, in addition to demonstrating anti-inflammatory effects. Adding theophylline to the combination of bronchodilators can be of further benefit to patients with stable COPD. The response to theophylline therapy may vary among patients with severe COPD. Patients metabolize theophylline primarily with the hepatic enzyme system, in a process that is affected by age, as well as by heart and liver abnormalities. Because of theophylline's potential for toxicity, monitor serum levels of theophylline during therapy. Adverse effects include anxiety, tremors, insomnia, nausea, cardiac arrhythmia, and seizures. The use of corticosteroids requires a careful evaluation for individual patients who, despite being on adequate bronchodilator therapy, develop an exacerbation or fail to improve sufficiently. Most studies suggest that 10-20% of patients with COPD improve if given chronic oral steroid therapy. Carefully document the effectiveness of such therapy (>20% improvement in FEV1) before giving a patient prolonged daily or alternate-day treatment. Researchers found a positive correlation between bronchial eosinophilia and bronchodilator response in patients who had mild to moderate airflow obstruction. Outpatients have successfully used oral steroids to treat acute exacerbations; however, after stabilization, gradually wean the patient off oral corticosteroids because of the potential adverse effects of these agents. In a meta-analysis of 16 controlled trials in patients with stable COPD, researchers found that approximately 10% of these patients responded to these drugs. Carefully identify recipients. An increase in FEV1 of more than 20% has been used as a surrogate marker for steroid response. In acute exacerbation of COPD, use steroids routinely to improve symptoms and lung function. In patients with COPD, chronic infection or colonization of the lower airways is common from Streptococcus pneumoniae, Haemophilus influenzae, and Moraxella catarrhalis. Empiric antimicrobial therapy must be comprehensive and should cover all likely pathogens in the context of the clinical setting. The goal of antibiotic therapy in COPD is not to eliminate the organisms, but to treat acute exacerbations. Exacerbations are indicated by increased sputum purulence and volume, as well as by the development of dyspnea along with other features, including fever, leukocytosis, or infiltrate on a chest radiograph. The first-line treatment choices include amoxicillin, cefaclor, and trimethoprim/sulfamethoxazole. Second-line antibiotic regimens are the more expensive antibiotics, including azithromycin, clarithromycin, and fluoroquinolones. The use of antibiotics in patients with COPD is supported by the results of a meta-analysis showing that patients who receive oral antibiotic therapy have a small, but clinically significant, improvement in peak expiratory flow rate and a rapid resolution of symptoms. Patients who benefit most are those whose exacerbations are characterized by increases in at least 2 of the Winnipeg criteria (ie, dyspnea, sputum production, sputum purulence). Mucolytic agents reduce sputum viscosity and improve secretion clearance. Viscous lung secretions in patients with COPD consist of mucus-derived glycoproteins and leukocyte-derived deoxyribonucleic acid (DNA). The oral agent N -acetylcysteine has antioxidant and mucokinetic properties; it is used to treat patients with COPD. COPD commonly is associated with progressive hypoxemia. Oxygen reduces mortality rates in patients with advanced COPD because of the favorable effects on pulmonary hemodynamics. 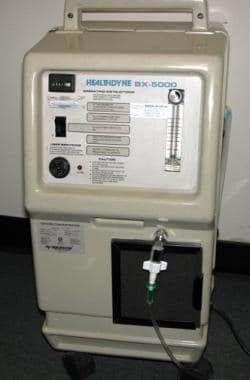 Two landmark trials (ie, The British Medical Research Council [MRC study] and the National Heart, Lung, and Blood Institute's Nocturnal Oxygen Therapy Trial [NOTT]) showed that long-term oxygen therapy improves survival 2-fold or more in hypoxemic patients with COPD. Hypoxemia is defined as PaO2 of less than 55 mm Hg or as oxygen saturation of less than 90%. Oxygen was used from 15-19 hours per day. Specialists therefore recommend long-term oxygen therapy for patients with a PaO2 of less than 55 mm Hg and a PaO2 of less than 59 mm Hg with evidence of polycythemia or cor pulmonale. Reevaluate these patients 1-3 months after initiating therapy, because some patients may not require long-term oxygen. The condition of many patients with COPD who are not hypoxemic at rest worsens during exertion. Even though studies designed to determine the long-term benefit of oxygen solely for exercise have not been conducted yet, home supplemental oxygen commonly is prescribed for these patients. Oxygen supplementation during exercise can reduce dyspnea, improve exercise tolerance, and prevent increases in pulmonary artery pressure. Oxygen therapy generally is safe. Oxygen toxicity from high-inspired concentrations (more than 60%) is well recognized. Little is known about the long-term effects of low-flow oxygen. The increased survival and QOL benefits of long-term oxygen therapy outweigh the possible risks. PaCO2 retention from depression of hypoxic drive has been overemphasized. PaCO2 retention is more likely a consequence of ventilation/perfusion mismatching rather than of respiratory center depression. Although this complication is not common, it is best avoided by titration of oxygen delivery in order to maintain PaO2 at 60-65 mm Hg. The major physical hazards of oxygen therapy are fires and explosions. Patients, family members, and other caregivers must be warned not to smoke. Overall, however, major accidents are rare and can be avoided by good patient and family training. The continuous flow nasal cannula is the standard means of oxygen delivery for the stable hypoxemic patient. 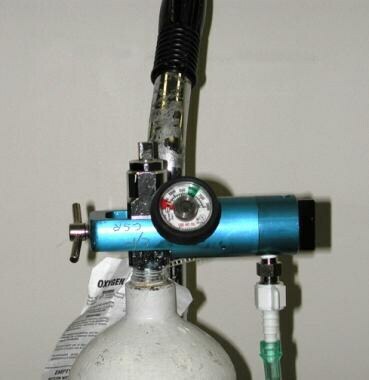 This means of oxygen delivery is simple, reliable, and generally well tolerated. 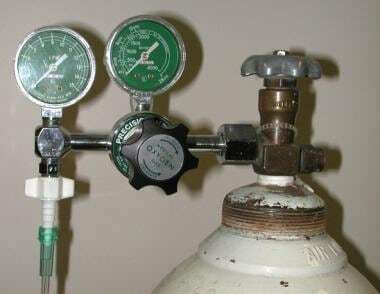 Each liter of oxygen flow adds 3-4% to the fractional inspired oxygen (FIO2). Nasal oxygen delivery is also beneficial for most mouth-breathing patients. Oxygen-conserving devices function by delivering all of the oxygen during early inhalation. These devices improve the portability of oxygen therapy and reduce overall costs. Three distinct oxygen-conserving devices exist (ie, reservoir cannulas, demand pulse delivery devices, transtracheal oxygen delivery systems). Transtracheal oxygen delivery involves the insertion of a catheter percutaneously between the second and third tracheal interspaces. Transtracheal oxygen delivery is invasive and requires special training by the physician, the patient, and the caregiver. The procedure has risks as well as medical benefits, but it also has limited application. Humidification generally is not beneficial when the patient receives oxygen by nasal cannula at flows of less than 5 L/min. 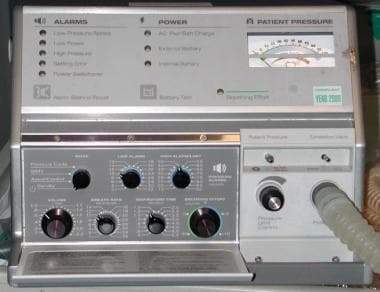 A home ventilator (LP6) is prescribed for selected patients with chronic respiratory failure. Bilevel positive airway pressure is a noninvasive ventilatory support; it is prescribed for patients with chronic respiratory failure who develop nocturnal hypoventilation (eg, patients with neuromuscular disorders and obesity hypoventilation syndrome). An oxygen concentrator provides a flow of up to 6 L/min for patients requiring long-term oxygen supplementation. 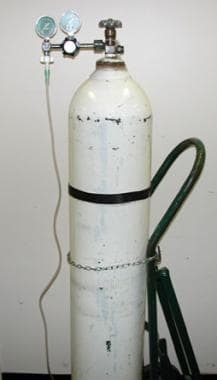 An oxygen tank with a ready supply of oxygen is given to patients for backup if the concentrator malfunctions. Courtesy of D. Sciberras. Influenza is an acute respiratory illness caused by influenza A or B viruses that occur in outbreaks and in epidemics worldwide almost every year. Influenza viruses that affect humans are classified into 2 antigenic subtypes: hemagglutinin (H) and neuraminidase (N). Three subtypes of hemagglutinin (H1, H2, H3) and 2 subtypes of neuraminidase (N1, N2) are recognized. The influenza vaccines are inactivated preparations of the virus or the split products. Several studies have examined the efficacy of influenza vaccine in different populations. A meta-analysis of 20 cohort studies in elderly persons had a pooled estimate of vaccine efficacy at 56%. These studies have found that in patients with chronic lung disease, administration of influenza vaccine substantially decreases mortality, hospitalization for influenza and pneumonia, exacerbation of chronic lung disease, and physician visits for respiratory complaints. The adverse effects of influenza vaccine are seen in fewer than 5% of cases and include low-grade fever and mild systemic symptoms. Vaccine is not recommended for people who are allergic to egg products. A small risk of Guillain-Barré syndrome (approximately 1 case per million vaccine recipients) may exist. Pharmacologic agents such as zanamivir (Relenza), an inhaled compound, and oseltamivir (Tamiflu), an orally ingested compound, have been demonstrated to be effective in the prophylaxis and therapy of influenza A and B infections. Both of these medications, if taken within 36 hours of the infection, have been shown to decrease the duration and severity of influenza symptoms. Oseltamivir resistance emerged in the United States during the 2008-2009 influenza season. Revised interim recommendations for antiviral treatment and prophylaxis of influenza were issued by the US Centers for Disease Control and Prevention (CDC). Preliminary data from a limited number of states indicated a high prevalence of influenza A (H1N1) virus strains that were resistant to oseltamivir. Because of this, zanamivir has been recommended as the initial choice for antiviral prophylaxis or treatment when influenza A infection or exposure is suspected. A second-line alternative is a combination of oseltamivir and rimantadine rather than oseltamivir alone. Local influenza surveillance data and laboratory testing can assist the physician with regard to the choice of antiviral agent. Influenza A viruses (including subtypes H1N1 and H3N2) and influenza B viruses currently circulate worldwide, but the prevalence of each can vary among and within communities over the course of an influenza season. In the United States, 4 prescription antiviral medications (oseltamivir, zanamivir, amantadine, rimantadine) have been approved for the treatment and chemoprophylaxis of influenza. Since January 2006, the neuraminidase inhibitors (oseltamivir, zanamivir) have been the only recommended influenza antiviral drugs because of widespread resistance to the adamantanes (amantadine, rimantadine) among influenza A (H3N2) virus strains. The neuraminidase inhibitors have activity against influenza A and B viruses, while the adamantanes have activity against only influenza A viruses. In 2007-2008, a significant increase in the prevalence of oseltamivir resistance was reported among influenza A (H1N1) viruses worldwide. During the 2007-2008 influenza season, 10.9% of H1N1 viruses tested in the United States were resistant to oseltamivir. Complete recommendations are available from the CDC. Ninety different capsular types of pneumococcus are known, making it impossible to manufacture a comprehensive vaccine. Thus, vaccines representing a subgroup of highly prevalent types have been formulated. The currently available pneumococcal vaccines include 23 purified capsular polysaccharide antigens, representing 85-90% of the types that cause invasive disease in the United States. The vaccine is administered intramuscularly as a single 0.5 mL dose. In rare cases, a second dose may be administered 5 years later. Mild, local adverse effects may develop; rare systemic reactions, such as fever and myalgias, also have been seen. Over the past 50-75 years, researchers have described a variety of surgical approaches for improving symptoms and restoring function in patients who suffer from emphysema. Only giant bullectomy and, possibly, lung volume reduction surgery are useful. Removal of giant bullae has been a standard approach in selected patients for many years. The bullae in patients with emphysema generally range in size from 1-4 cm in diameter; however, on occasion, giant bullae can occupy more than 33% of the hemithorax. Giant bullae may compress adjacent lung tissue, thereby reducing the blood flow to and ventilation of the normal tissue. Removal of these bullae may result in the expansion of compressed lungs and improved function. Patients who are symptomatic and have an FEV1 of less than 50% predicted have a better outcome after bullectomy, which is performed through either a midline sternotomy or a lateral incision with or without video-assisted thoracoscopy. Postoperative leaks are the major potential complications. Giant bullectomy can produce subjective and objective improvement in selected patients who have bullae that compress the adjacent lung and that occupy at least 30% (but preferably, 50%) of the hemithorax, who have an FEV1 of less than 50% predicted, and who otherwise have relatively preserved lung function. Brantigan and colleagues first reported resectioning surgery for diffuse emphysema in 33 patients. They resected the 20-30% of each lung that appeared the most diseased. Brantigan hypothesized that removal of a portion of the emphysematous lung increased the radial traction on the airways in the remaining part of the lung, thereby reducing symptoms by improving the respiratory system's expiratory airflow and mechanical function. Lung volume reduction surgery (LVRS) subsequently gained considerable momentum, after researchers documented a marked improvement in the FEV1 (+82%), the forced vital capacity (FVC; +27%), the 6-minute walk distance, and QOL indices. Currently, large, prospective clinical trials are underway in the US and Canada to evaluate the effectiveness of LVRS. The indications and patient selection criteria for LVRS have not been rigorously defined. Generally, candidates for LVRS have symptoms that are secondary to severe emphysema, as well as having marked hyperinflation (ie, elevated residual volume/total lung capacity [RV/TLC] ratio) and computed tomography (CT) scan evidence of heterogeneous emphysema. The study excluded patients who are hypercapnic or who have pulmonary hypertension or other cardiac risk factors. Lung transplantation continues to gain acceptance for the treatment of end-stage lung disease, particularly emphysema and idiopathic pulmonary fibrosis. Lung transplantation also is used in patients with sarcoidosis, eosinophilic granuloma, extrinsic allergic alveolitis, lymphangioleiomyomatosis, pulmonary hypertension, cystic fibrosis, and severe bronchiectasis. Single lung transplantation is preferred, because bilateral lung transplantation does not significantly alter patient survival. The initial morbidity and mortality is slightly less following a single transplant, and the lungs from 1 donor can be used to benefit 2 patients. The double lung transplant is used for patients with cystic fibrosis, because a single transplanted lung would be susceptible to the spread of infection from the native lung. Patients with severe pulmonary hypertension have received double lung transplantation in the past to minimize hemodynamic instability. Patients treated with a double lung transplant tolerate bronchiolitis obliterans syndrome better than do patients with a single transplant. For donor selection, a 10-20% difference in size between the donor and the recipient lungs is acceptable. Only blood group typing is performed. The recipient must have no history of a recent malignancy and should be taking less than 20 mg of prednisone per day. Patients aged 65 years or less are candidates for single transplant, and patients aged 55 years or less are candidates for a bilateral transplant. Patients with a multisystem disease are considered to be poor candidates for lung transplant. Patients with cystic fibrosis and pulmonary infection with pan antibiotic–resistant organisms (especially Pseudomonas cepacia) have high rates of reinfection after transplant, as well as a greater mortality rate. All patients being evaluated for lung transplant undergo CT scanning of the chest, and all noncalcified nodules need to be evaluated to exclude malignancy. Survival for patients undergoing single lung transplantation is approximately 70-90% at 1 year and 50% at 3 years. Prognosis for survival is best in patients who require transplant for obstructive pulmonary disease. The proper timing of the transplant is difficult to assess; the patients selected to receive a transplant should have a life expectancy of 2 years or less. With lung transplantation, the profound dyspnea and limited lifestyle is replaced with improved QOL at the risk of worsening survival. These interventions are provided by a multidisciplinary team that often includes physicians, nurses, respiratory therapists, physical therapists, occupational therapists, psychologists, and social workers. The training specificity refers to the benefit gained only in those activities involving the specific muscle groups that are trained. Because the performance of many ADL involves the use of the arms, endurance training of the upper extremities to improve arm function is important. Supported arm exercises are prescribed with ergometry or unsupported arm exercises by lifting free weights or stretching armbands. Because peripheral muscle weakness contributes to exercise limitation in patients with lung disease, strength training is a rational component of exercise training during pulmonary rehabilitation. Even low-intensity leg and arm muscle conditioning has led to reduced ventilatory equivalent for oxygen and carbon dioxide. See the images below. A regular walking schedule is an important component of pulmonary rehabilitation. Walking distance is increased progressively, and oxygen supplementation often is used in a patient who desaturates with exercise. Lower extremity exercise by stationary bicycling improves strength and endurance. The reversibility of training effects is well known. The effects of training are maintained only as long as exercise is continued. Therefore, efforts at improving long-term adherence with exercise training at home are necessary for the long-term effectiveness of pulmonary rehabilitation. These principles assist patients in maintaining ADL and in performing job-related tasks. The methods include paced breathing, optimization of body mechanics, advanced planning, prioritization of activities, and use of assisted devices. Education about types of medication and about the action, adverse effects, dose, and proper use of all oral and inhaled medication is an important part of a comprehensive pulmonary rehabilitation program. Instructions in metered-dose inhaler technique and spacer devices, as well as appropriate use of oxygen, are particularly important. Because of the progressive nature of COPD, risk of respiratory failure increases over time. Unfortunately, clinical factors that are assessable at the onset of respiratory failure caused by COPD are poor predictors of the outcome of mechanical ventilation. The decision to initiate life support, therefore, requires patients to determine the acceptability of life-sustaining care by combining their own personal values and life goals with their physician's uncertain estimates of a meaningful recovery. Education during pulmonary rehabilitation provides patients with an understanding of life-sustaining interventions and of the importance of advanced planning. Anxiety, depression, difficulties in coping with chronic lung disease, and the inability to cope with illness contribute to the handicap of advanced respiratory disease. Psychosocial and behavioral interventions in the form of regular patient education sessions or support groups focusing on specific problems are very helpful. Instructions in progressive muscle relaxation, stress reduction, and panic control may help to reduce dyspnea and anxiety. Because of the effects of chronic respiratory disease on the family, participation of family members or friends in pulmonary rehabilitation support groups is encouraged. Patients exhale slowly for 4-6 seconds through pursed lips held in a whistling position. This technique relieves dyspnea by increasing expiratory airway pressure, thereby inhibiting dynamic expiratory airway collapse. Patients also shift their breathing pattern from a rapid respiratory rate, which is under involuntary respiratory center control, to a slower, more controlled pattern governed by voluntary cortical function. The overall work of breathing does not change and, in fact, may increase slightly. The pursed-lip breathing shifts a major portion of the inspiratory work of breathing from the diaphragm to the ribcage muscles, resting the diaphragm and reducing dyspnea. The image below depicts pursed-lip breathing. 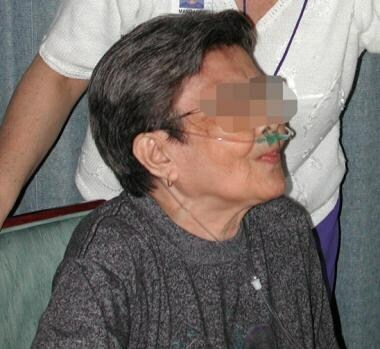 Pursed lip breathing is taught to patients with severe chronic obstructive pulmonary disease (COPD). Pursed lip breathing may help to decrease dynamic hyperinflation, particularly during exercise. Leaning-forward postures frequently relieve dyspnea in patients with COPD by reducing respiratory effort. The shifting of abdominal contents elevates the depressed diaphragm cranially, resulting in improved performance. The most benefit occurs in patients with severe hyperinflation, who have paradoxical inward movement of the upper abdomen. Some patients may benefit from this technique. The patient is taught to employ only the diaphragm during inspiration and to maximize abdominal protrusion. During expiration, the patient may contract the abdominal wall muscles to displace the diaphragm more cephalad. Not all patients with COPD benefit from this technique; therefore, close clinical monitoring to ascertain efficacy is required. Chest physical therapy, along with postural drainage, enhances mucus clearance from central and peripheral lung airways. The value of this therapy in stable patients with COPD and in acute COPD exacerbation is uncertain. Nonetheless, for patients who produce more than 30 mL of sputum every 24 hours or who have difficulty with sputum expectoration, chest physical therapy combined with postural drainage and effective coughing techniques enhances sputum expectoration; the actual benefit, however, has not been determined. Chest physical therapy remains an essential component of therapy for bronchiectasis and cystic fibrosis. 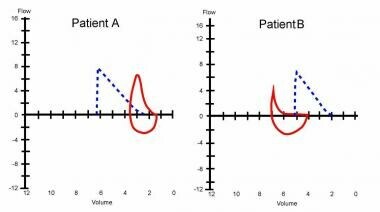 The frequency of treatments must be individualized based on the severity of disease and on the quantity of airway secretions that must be cleared. Standard chest physical therapy with postural drainage, cough, and the forced expiratory technique is the cornerstone of such treatment regimen. Newer modalities, such as mechanical chest percussion and mask positive airway pressure, warrant further clinical trials before they can be used routinely. Chest physiotherapy is essential for the management of atelectasis in postoperative or seriously ill patients with COPD who are hospitalized. 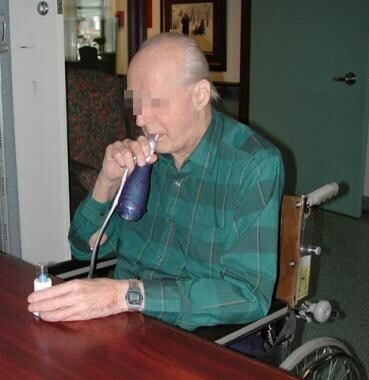 The image below depicts a patient using a flutter device to aid in sputum expectoration. A flutter device is sometimes used to aid in sputum expectoration in patients with bronchiectasis or chronic bronchitis who have a large amount of sputum production. Courtesy of D. Sciberras. The onset of weight loss in a patient with chronic respiratory disease is a poor prognostic indicator. Approximately 50% of hospitalized patients with COPD are reported to suffer from protein and calorie malnutrition. Progressive weight loss occurs from inadequate dietary intake, diet-induced thermogenesis, increased resting energy expenditure, and failure of normal adaptive response to undernutrition. These mechanisms lead to energy imbalance and weight loss. Maintenance of adequate nutritional status by timely screening and appropriate management is essential. Provide patient education in weight maintenance techniques and emphasize the importance of preserving muscle mass and tissue stores. Optimal nutritional status in pulmonary rehabilitation should help to maximize the patient's state of health, respiratory muscle function, and overall sense of well-being; it also may improve disease outcome. Obesity, which is defined as a body weight that is 20% greater than the ideal body weight, may be detrimental to respiratory function. The large fat mass increases the work of the compromised respiratory system, particularly during weight-bearing activities. Encourage reduction of the body fat mass in this patient population. A diet history includes an assessment of nutritional, medical, and socioeconomic factors, as well as of other pertinent details that affect adequate nutrition intake. The calculation of percentage of ideal body weight by comparing measured body weight with a standard or group norm has traditionally been performed. This assessment does not take account of lean body mass, although serial follow-up measurements are useful. Other approaches to estimating body composition are useful. Anthropometry can be used for assessment of lean body mass. The bioelectrical impedance analysis is easy to use, noninvasive, and relatively inexpensive. Biochemical tests have been advocated as a marker of nutritional status; they include albumin, prealbumin, transferrin, and retinol-binding protein. However, these indicators generally are not reliable in identifying inadequate nutrition. They should not be used alone in assessing nutritional status. Outcome assessment is an important component of a comprehensive pulmonary rehabilitation program, being used to determine individual patient responses and to evaluate the overall effectiveness of the program. Consideration also should be given to follow-up measurements after longer periods of time, such as 6 and/or 12 months. Progressive exercise testing on a stationary bicycle or treadmill is performed to a heart rate of 85% of predicted maximum. Dyspnea during exertion can be rated using a visual analogue scale. This test is reproducible and is sensitive to improvements from pulmonary rehabilitation. Instead of an incremental increase in work rate, endurance capacity can be measured at a constant fraction of maximal work rate. A longer exercise time indicates greater exercise endurance and leads to a reduction in ventilatory requirements. The 6-minute and 12-minute walk tests, as well as shuttle walk tests, correlate positively to peak exercise performance on graded exercise tests. The minimal increase that is clinically meaningful in 6-minute walking distance is about 54 meters. Dyspnea is the most common symptom of individuals with chronic pulmonary disease and is frequently the major reason for seeking acute care. The effect of dyspnea on daily activities can be measured with the Medical Research Council dyspnea questionnaire or with the dyspnea component of the chronic respiratory disease questionnaire. The relief in dyspnea correlates with a fallen ventilatory demand during exercise, indicating a training effect. Functional capacity is what the patient is capable of doing, whereas functional performance is what the patient actually does on a day-to-day basis. Functional reserve is the difference between the two of these; pulmonary rehabilitation improves a patient's functional reserve. Functional status usually is measured by a questionnaire, which estimates the impact of the program on various activities. A health-related QOL instrument can assess the overall benefit of improvements in the patient's symptoms, disability, and handicap. QOL has been described as a person's satisfaction or happiness with life in demands that the patient considers important. QOL may be considered a balance between what is desired in life and what is achieved (although these indicators are difficult to measure). The disease-specific measures demonstrate greater sensitivity to change from baseline after rehabilitation intervention. Despite the progress made in understanding pulmonary rehabilitation, more information is needed to ensure appropriate treatment for the increasing number of patients with chronic respiratory disease. Pulmonary rehabilitation remains an art of medical practice, but one that is built increasingly on a foundation of scientific research. The research embraces traditional outcome measures (eg, mortality and physiologic indices of lung and exercise function), as well as psychosocial measures (eg, symptoms, health-related QOL, economic analysis of costs and benefits). New evidence strengthens previous recommendations that pulmonary rehabilitation encompassing lower and upper extremity exercise training improves dyspnea and health-related QOL outcomes. Additional evidence supports improvements in healthcare utilization and psychosocial outcomes. Insufficient data support survival benefit at this time. Some new evidence indicates that longer-term rehabilitation, maintenance strategies following rehabilitation, and incorporation of education and strength training in pulmonary rehabilitation are beneficial. Data on routine use of inspiratory muscle training, anabolic drugs, or nutritional supplementation are insufficient to recommend incorporating these in pulmonary rehabilitation. Supplemental oxygen therapy for patients with severe hypoxemia at rest or with exercise has shown to be beneficial. Noninvasive ventilation may be helpful for selected patients with advanced COPD. Finally, pulmonary rehabilitation appears to benefit patients with chronic lung diseases other than COPD. Few data have been published on the impact of pulmonary rehabilitation on health care costs and survival; controlled studies in both areas are needed. Exercise training is an important component of pulmonary rehabilitation. Little is known about the additional benefit of education, breathing strategies, psychosocial support, and group therapy. Knowledge of the effectiveness of these components would be beneficial for other patients who cannot exercise. More remains to be learned regarding the intensity, duration, and optimum form of exercise training. The benefits of strength training and the best exercises for upper extremity training are unknown. The benefits of respiratory muscle rest with noninvasive, positive-pressure mechanical ventilation need to be further explored. Perhaps for selected patients with stable but advanced chronic obstructive pulmonary disease (COPD), noninvasive positive pressure ventilation could be used to help patients exercise more. The optimal frequency of a pulmonary rehabilitation program is not well established. Whether more frequently repeated pulmonary rehabilitation in patients with COPD leads to physiological gains and decreases the hospitalization rate is not known. Data suggest that in severe and disabling COPD, frequently repeated inpatient pulmonary rehabilitation may lead to some additional physiological and clinical benefits over 1 year. Too often, the questionnaires for outcome assessment are long, difficult to administer, and complex to score. Simplifying or minimizing the current instruments without sacrificing their discriminative capability or their ability to detect change with intervention would be beneficial. Not much scientific information is available on the effectiveness of pulmonary rehabilitation in diseases other than COPD and asthma. Do patients with pulmonary fibrosis or chest wall disease improve with pulmonary rehabilitation? Do pediatric patients improve with pulmonary rehabilitation? These questions should be assessed in future investigations. As an established preventive health care strategy for patients with chronic lung disease that is effective, noninvasive, and low in cost, pulmonary rehabilitation is an ideal subject for logical scientific inquiry. Spruit MA. Pulmonary rehabilitation. Eur Respir Rev. 2014 Mar 1. 23 (131):55-63. [Medline]. [Full Text]. Nici L, Donner C, Wouters E, et al. American Thoracic Society/European Respiratory Society statement on pulmonary rehabilitation. Am J Respir Crit Care Med. 2006 Jun 15. 173(12):1390-413. [Medline]. Puhan MA, Frey M, Büchi S, et al. The minimal important difference of the hospital anxiety and depression scale in patients with chronic obstructive pulmonary disease. Health Qual Life Outcomes. 2008 Jul 2. 6:46. [Medline]. [Full Text]. He M, Yu S, Wang L, Lv H, Qiu Z. Efficiency and safety of pulmonary rehabilitation in acute exacerbation of chronic obstructive pulmonary disease. Med Sci Monit. 2015 Mar 18. 21:806-12. [Medline]. [Full Text]. du Moulin M, Taube K, Wegscheider K, et al. Home-based exercise training as maintenance after outpatient pulmonary rehabilitation. Respiration. 2008 Jul 31. [Medline]. Brown AT, Hitchcock J, Schumann C, Wells JM, Dransfield MT, Bhatt SP. Determinants of successful completion of pulmonary rehabilitation in COPD. Int J Chron Obstruct Pulmon Dis. 2016. 11:391-7. [Medline]. [Full Text]. US Preventive Services Task Force. Counseling and interventions to prevent tobacco use and tobacco-caused disease in adults and pregnant women: U.S. Preventive Services Task Force reaffirmation recommendation statement. Ann Intern Med. 2009 Apr 21. 150(8):551-5. [Medline]. Hurt RD, Sachs DP, Glover ED, et al. A comparison of sustained-release bupropion and placebo for smoking cessation. N Engl J Med. 1997 Oct 23. 337(17):1195-202. [Medline]. [Full Text]. Lacasse Y, Wong E, Guyatt GH, et al. Meta-analysis of respiratory rehabilitation in chronic obstructive pulmonary disease. Lancet. 1996 Oct 26. 348(9035):1115-9. [Medline]. Meyers BF, Sultan PK, Guthrie TJ, et al. Outcomes after unilateral lung volume reduction. Ann Thorac Surg. 2008 Jul. 86(1):204-11; discussion 211-2. [Medline]. Belman MJ. Exercise in patients with chronic obstructive pulmonary disease. Thorax. 1993 Sep. 48(9):936-46. [Medline]. [Full Text]. Belman MJ. Exercise in chronic obstructive pulmonary disease. Clin Chest Med. 1986 Dec. 7(4):585-97. [Medline]. Lee AL, Holland AE. Time to adapt exercise training regimens in pulmonary rehabilitation--a review of the literature. Int J Chron Obstruct Pulmon Dis. 2014. 9:1275-88. [Medline]. [Full Text]. Butcher SJ, Jones RL. The impact of exercise training intensity on change in physiological function in patients with chronic obstructive pulmonary disease. Sports Med. 2006. 36(4):307-25. [Medline]. Lake FR, Henderson K, Briffa T, et al. Upper-limb and lower-limb exercise training in patients with chronic airflow obstruction. Chest. 1990 May. 97(5):1077-82. [Medline]. [Full Text]. Meshe OF, Claydon LS, Bungay H, Andrew S. The relationship between physical activity and health status in patients with chronic obstructive pulmonary disease following pulmonary rehabilitation. Disabil Rehabil. 2016 Apr 6. 1-11. [Medline]. Koppers RJ, Vos PJ, Boot CR, et al. Exercise performance improves in patients with COPD due to respiratory muscle endurance training. Chest. 2006 Apr. 129(4):886-92. [Medline]. [Full Text]. Norwood R. Prevalence and impact of depression in chronic obstructive pulmonary disease patients. Curr Opin Pulm Med. 2006 Mar. 12(2):113-7. [Medline]. Gosselink R. Breathing techniques in patients with chronic obstructive pulmonary disease (COPD). Chron Respir Dis. 2004. 1(3):163-72. [Medline]. Mueller RE, Petty TL, Filley GF. Ventilation and arterial blood gas changes induced by pursed lips breathing. J Appl Physiol. 1970 Jun. 28(6):784-9. [Medline]. Schols AM, Mostert R, Soeters PB, et al. Body composition and exercise performance in patients with chronic obstructive pulmonary disease. Thorax. 1991 Oct. 46(10):695-9. [Medline]. [Full Text]. Gray-Donald K, Gibbons L, Shapiro SH, et al. Nutritional status and mortality in chronic obstructive pulmonary disease. Am J Respir Crit Care Med. 1996 Mar. 153(3):961-6. [Medline]. Chun EM, Han SJ, Modi HN. Analysis of diaphragmatic movement before and after pulmonary rehabilitation using fluoroscopy imaging in patients with COPD. Int J Chron Obstruct Pulmon Dis. 2015. 10:193-9. [Medline]. [Full Text]. Sandland CJ, Morgan MD, Singh SJ. Detecting oxygen desaturation in patients with COPD: Incremental versus endurance shuttle walking. Respir Med. 2008 Aug. 102(8):1148-52. [Medline]. Maestri R, Bruschi C, Fracchia C, Pinna GD, Fanfulla F, Ambrosino N. Physiological and clinical characteristics of patients with COPD admitted to an inpatient pulmonary rehabilitation program: A real-life study. Pulmonology. 2018 Aug 21. [Medline]. [Full Text]. Mahler DA, Faryniarz K, Lentine T, et al. Measurement of breathlessness during exercise in asthmatics. Predictor variables, reliability, and responsiveness. Am Rev Respir Dis. 1991 Jul. 144(1):39-44. [Medline]. Bourbeau J, Julien M, Maltais F, et al. Reduction of hospital utilization in patients with chronic obstructive pulmonary disease: a disease-specific self-management intervention. Arch Intern Med. 2003 Mar 10. 163(5):585-91. [Medline]. [Full Text]. Cecins N, Geelhoed E, Jenkins SC. Reduction in hospitalisation following pulmonary rehabilitation in patients with COPD. Aust Health Rev. 2008 Aug. 32(3):415-22. [Medline]. Ries AL, Kaplan RM, Limberg TM, et al. Effects of pulmonary rehabilitation on physiologic and psychosocial outcomes in patients with chronic obstructive pulmonary disease. Ann Intern Med. 1995 Jun 1. 122(11):823-32. [Medline]. Guo SE, Bruce A. Improving Understanding of and Adherence to Pulmonary Rehabilitation in Patients with COPD: A Qualitative Inquiry of Patient and Health Professional Perspectives. PLoS One. 2014. 9(10):e110835. [Medline]. [Full Text].